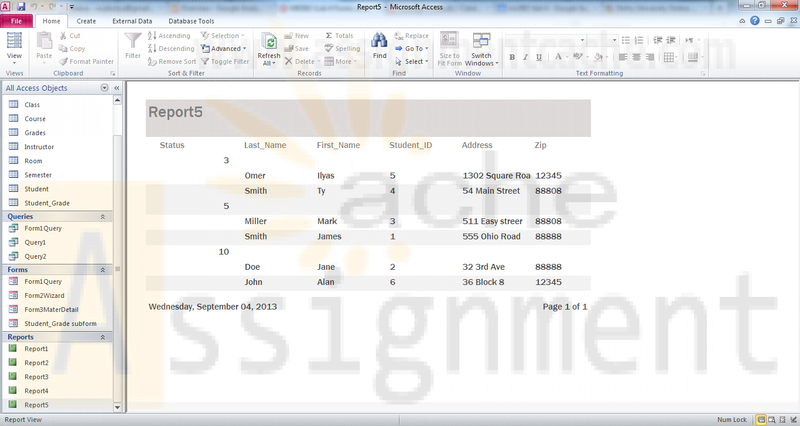 In this assignment, you will learn to create and save forms and reports in a provided Access database. 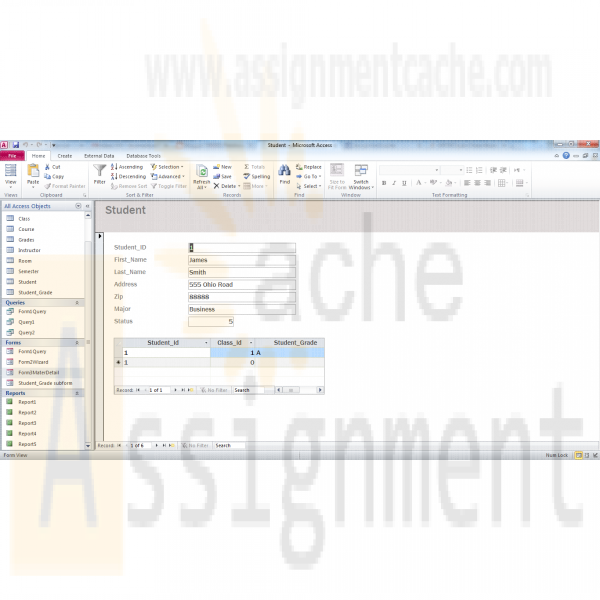 To complete this assignment, you will need to be able to run Access 2010. Name your Access database file using Lab4_, your first initial, and your last name (e.g., Lab4_JSmith.accdb). Create and save your Access database file. When you are done, submit your database to the Course Project Dropbox. • Download the Lab4_FormsReports.accdb database from Doc Sharing. • Rename the Lab4_FormsReports.accdb database with a name containing Lab4_, your first initial, and your last name as the file name (e.g., Lab4_JSmith.accdb). • Run Access 2010, either via Citrix or from Visio 2010 installed on your workstation. • Open the database you renamed in Step 1. Create a report for each of the following requirements. Reports may be created using the wizard or an SQL query. Reports should follow the formatting guidelines given in the next step. Reports should be named as indicated below (e.g., Report1, Report2, etc.). 1. Report1: Show Instructor information (Instructor_ID, First_Name, Last_Name) grouped by Approved Course_No. 2. Report2: Show student information (Student_ID, First_Name, Last_Name, Status, Zip) grouped by Major. 3. Report3: Show student information (Student_ID, First_Name, Last_Name, Major) grouped by Zip code. Zip codes should be in increasing order. 4. Report4: Show student information (First_Name, Last_Name) grouped by Course Number and Course Name. Course Number should be in in increasing order. 5. Report5: Show student information (Student_ID, First_Name, Last_Name, Address, Zip) grouped by Status. Students should be in alphabetical order by Last_Name and;then First_Name. • There should be at least two child rows of data for each parent row. Add data to the tables in order to have reports show at least two child rows per parent. Form1: Create a form based on an SQL query. • Create and run an SQL query that displays Student Information (Student_ID, First_Name, Last_Name, Address, Zip). • Save the query in the database named Form1Query. • Create a form based on Form1Query. While Form1Query is selected, go to the Create menu and select Form to build the basic form. • Select the form and switch between the views (Forms, Layout, and Design) to change the properties or the form’s appearance as desired. • Save the form in the database named Form1Query. Form2: Create a form using the Form Wizard. • Invoke the Form Wizard as shown in the tutorials above. • Using the Form Wizard, create a form showing instructor information (Instructor_ID, First_Name, Last_Name, Office_No). • Switch between the views (Forms, Layout, and Design) to change the properties or the form’s appearance as desired. • Save the form in the database named Form2Wizard. Form3: Create a form using a master detail relationship. A master detail relationship is simply a 1:N relationship between two tables. Use subforms to format the form in a split data entry form as shown in Figure 1-9. You may use SQL queries or the wizard or both to create your form and subform. • Create a master form showing student information (Student_ID, First_Name, Last_Name, Address, Zip, Major, Status). • Create a detail Subform showing Student_ID, Class_ID, and Student_Grade. • For each student displayed, the student’s classes and grades should be displayed in the detail form. • Switch between the views (Forms, Layout, and Design) to change the properties or the form’s appearance. • Save the form in the database named Form3MaterDetail. When you are done, save the file on your local hard drive and upload it to the Course Project Dropbox. Your file should have the following filename format: Lab4_FirstInitialLastName.accdb.